It’s not easy for me to find attractive stretch knit fabric here in West Wiltshire. My local fabric shop has a wonderful stock of different cottons and poly-cottons, but the knits are very limited indeed. 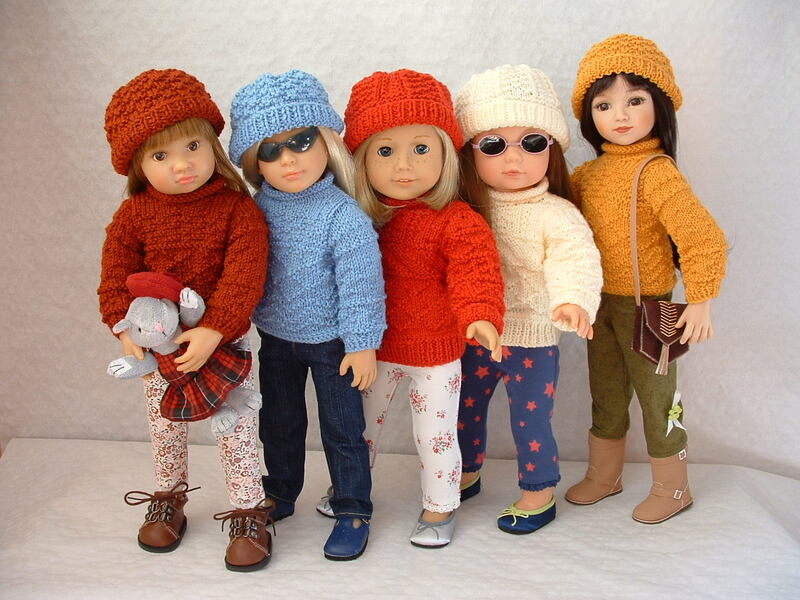 But as some have noticed, recently my girlies have been sporting some very fetching leggings – check out Annika, Kit and Elisabeth in this photo… I didn’t buy the leggings, exactly – well I did, but they needed some work to make them fit the girls. 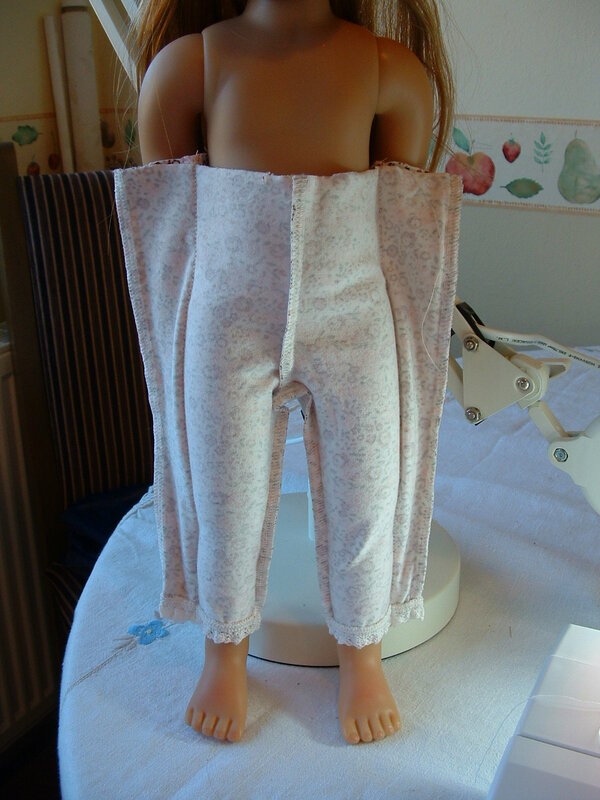 The truth is that I’ve discovered a really easy way to make leggings for 18″ dolls. Some of you have asked me how I made them. So for Ronklei from Ravelry, and others, here’s my tutorial on how to cheat at leggings. Note: As usual, I’ve kept the photos to a reasonably small size on this page, but as always, you can click on them to see them full size and study the details (should you want to). One pair of leggings for a baby 0-1 months old – the smallest size (my local supermarket has a great selection). 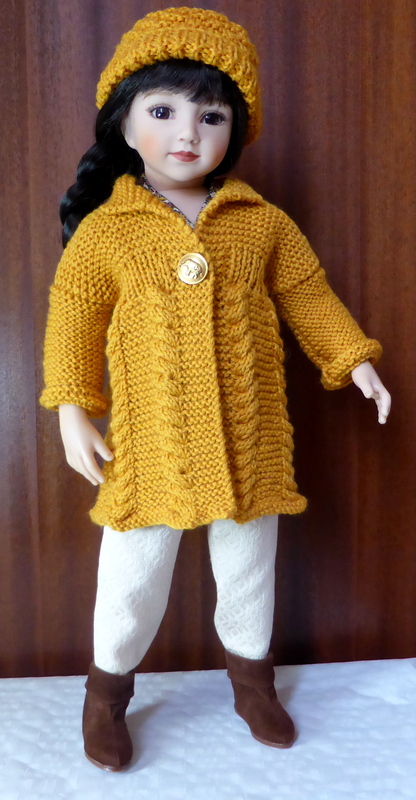 If these aren’t available you could just about manage with the larger 0-3 months size but the legs are a little longer and the body may need shortening more. 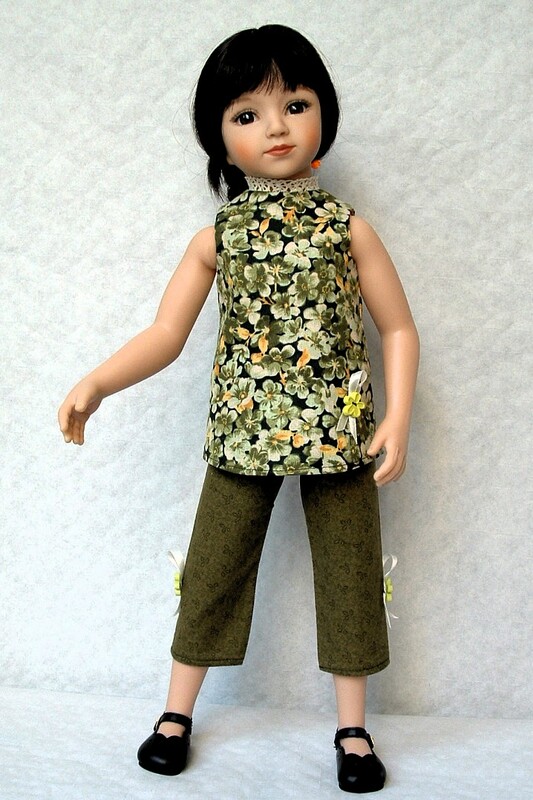 One 18″ doll desperate for leggings – slim or sturdy-bodied, it makes no difference. 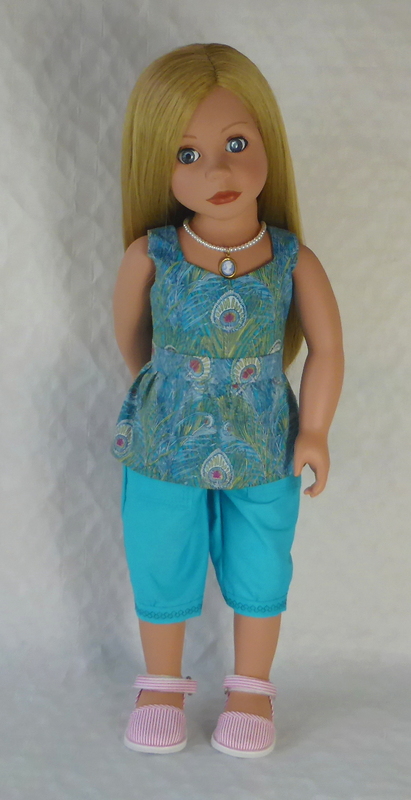 OK, maybe a 19″ doll like Gotz Hannah would be fine too. Any taller and you’ll need to go for the next size up baby leggings, or go for a cropped style. For 20″ Maru, for example, the 0-3 months size will give a better leg length. 1. 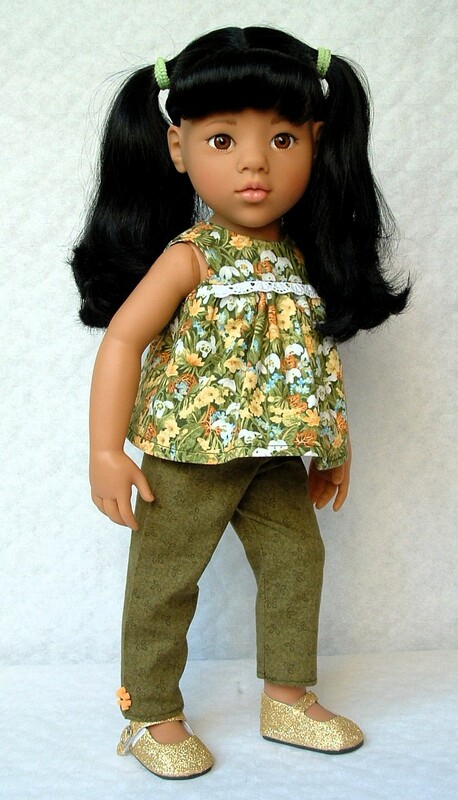 Try the leggings on your doll to check the size. Here’s Kidz ‘n’ Cats Annika looking swamped in leggings pulled up a bit too well. As you can see the leg length is fine, it’s the width and the body length that is overwhelming. So we need to slim the legs and cut down the body (it’s all right, Annika, I don’t mean you!). Not designed for a slim Kidz. 2. 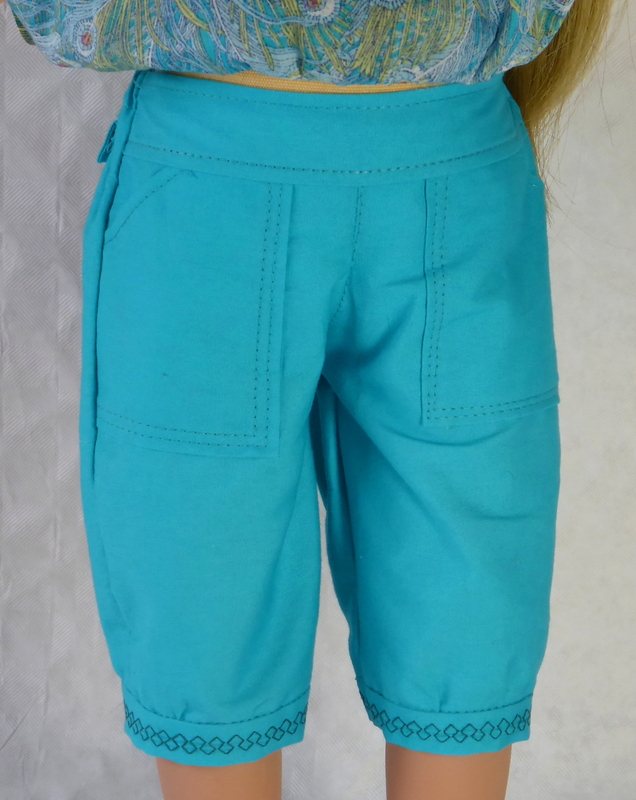 Turn the leggings inside out and cut off the elasticated waistband. Do it carefully so that it’s cut evenly all around. You’ll make a new waistband later. 3. 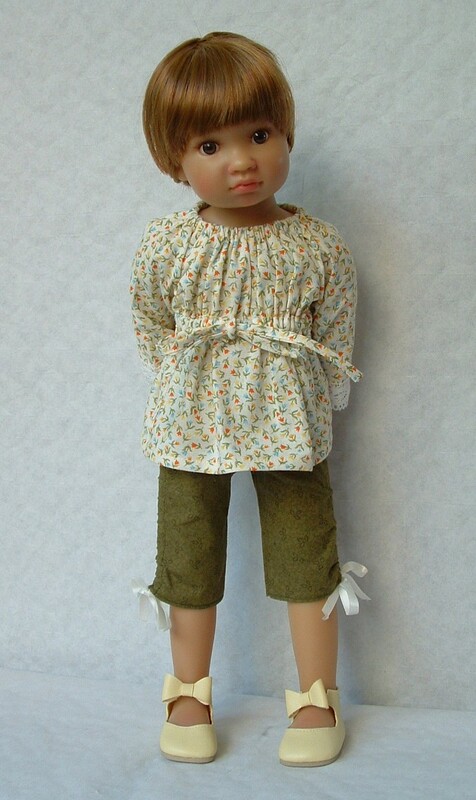 Making sure the leggings are inside out, pin through both layers of material close to the outside of the doll’s legs, marking your sewing line. The fabric needs to fit snugly to the body without being over-stretched. Make sure they’re inside out before you start pinning! 4. 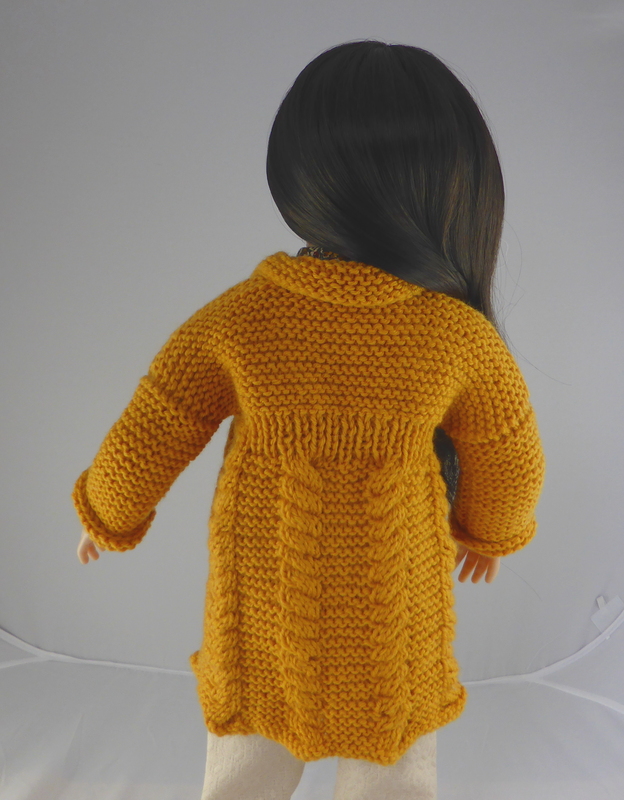 Turn the doll over and check the back view. Like they said on The Great British Sewing Bee, we don’t want any saggy bottoms! 5. 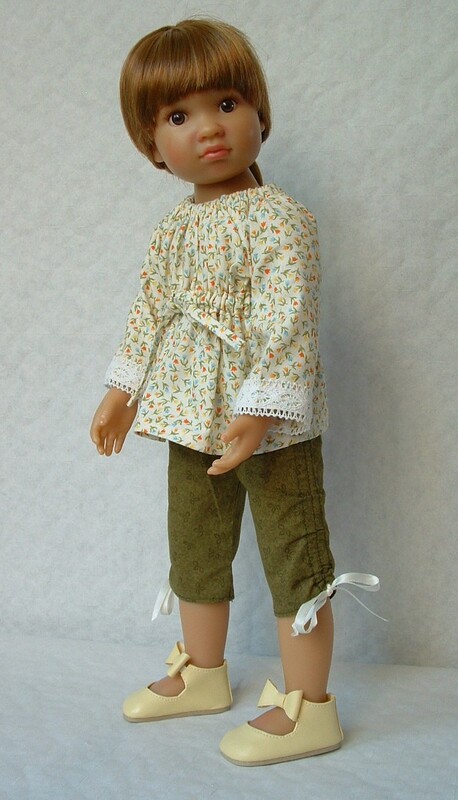 Slip the doll out of the leggings and check you have pinned them evenly, especially on the body section. It would be easy to get the crotch seam over to one side. 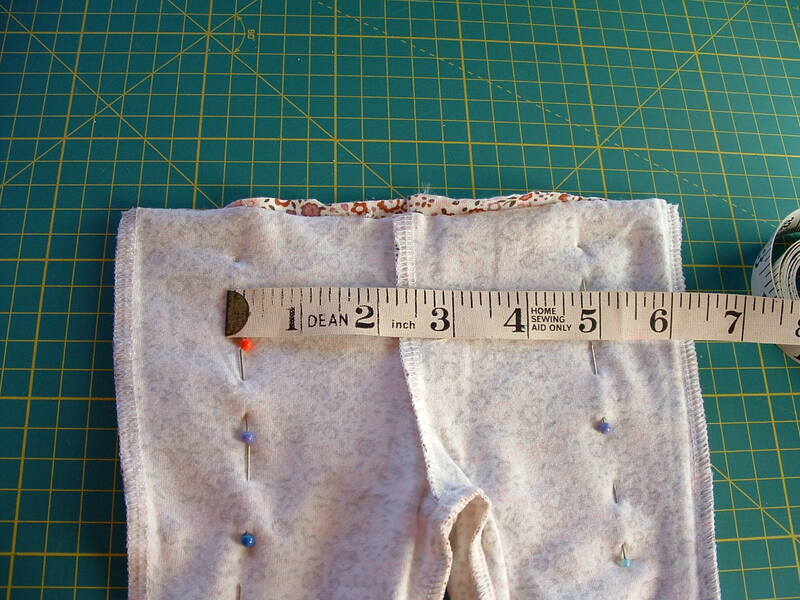 I checked with a tape measure – for the Kidz, the body width is 5″ (13 cm), so I needed 2½” each side of the crotch seam. 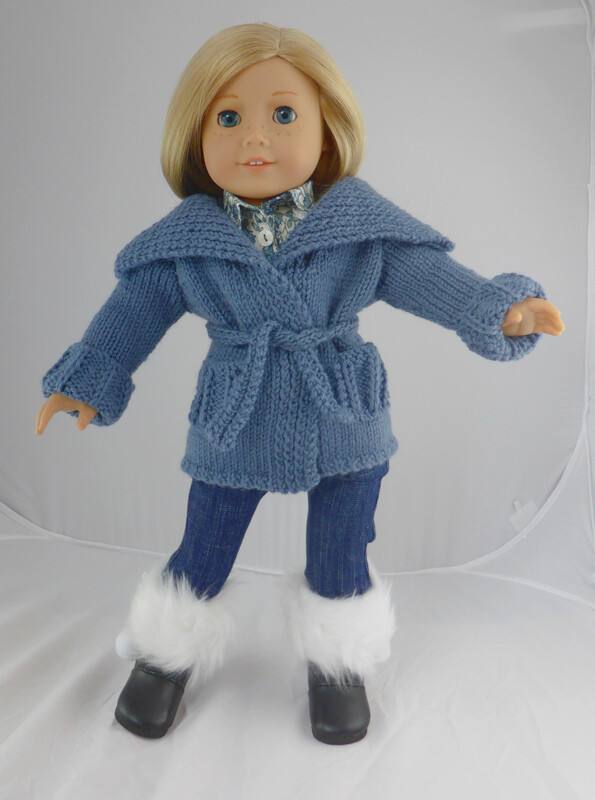 The body and leg width will be slightly more for American Girl and the other sturdy-bodied dolls, of course, but the thing about this method is that you whatever the size of your doll, the leggings are guaranteed to fit. You can also adjust lie of the pins at this stage so they line up to form a really helpful guide for your seam lines. 6. Now it’s time to sew the seams. 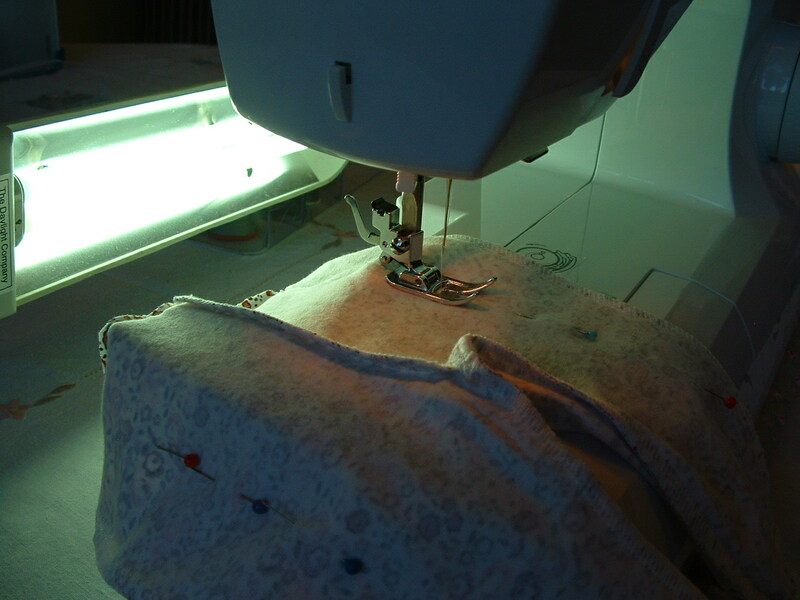 I only have a sewing machine so the seams and the neatening are done in two stages. 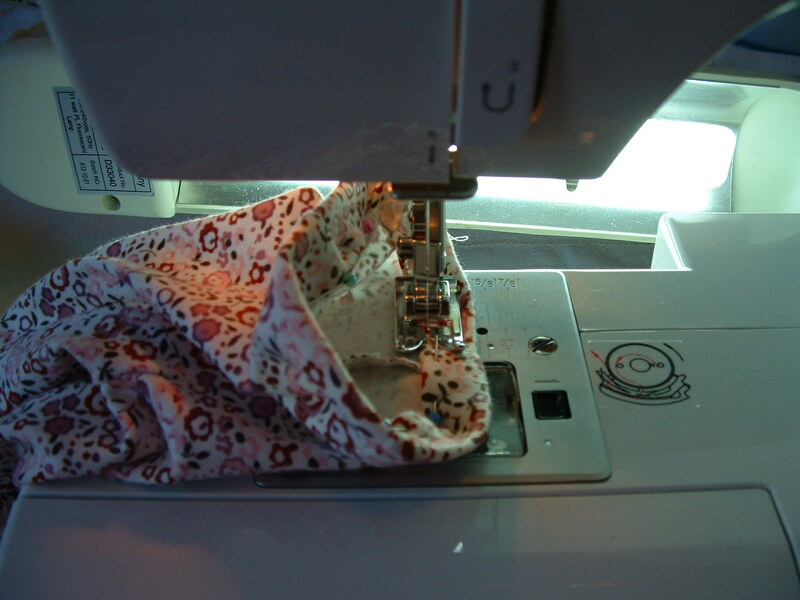 If you have an overlocker/serger, you can do steps 6-8 all in one go. So for the sewing machine users, use a straight stretch stitch and stitch along your marked seam lines, removing your pins as you go. Take care at the ankle as you want the cuff edges to meet perfectly, and the material will want to stretch out of alignment here. 7. 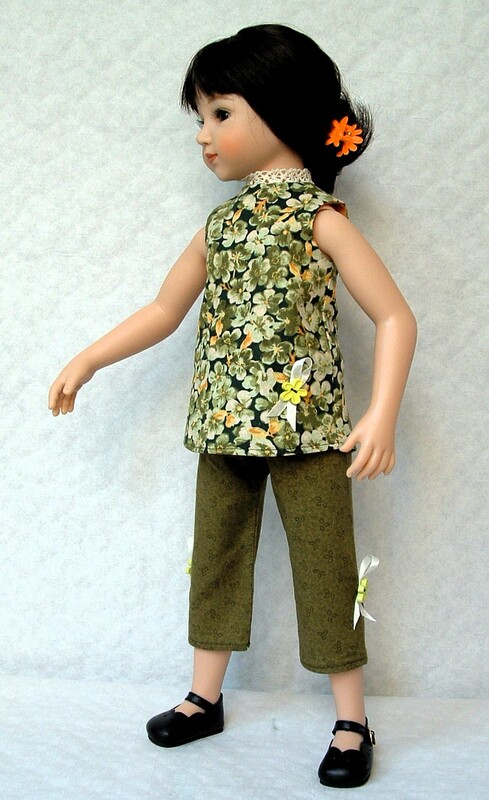 Try the leggings on the doll, just to check they’re OK before you start trimming away the excess fabric. Pray you’ve got it right because unpicking a stretch stitch is a nightmare. This is why step 5 is so important – you don’t want to mess up. 8. 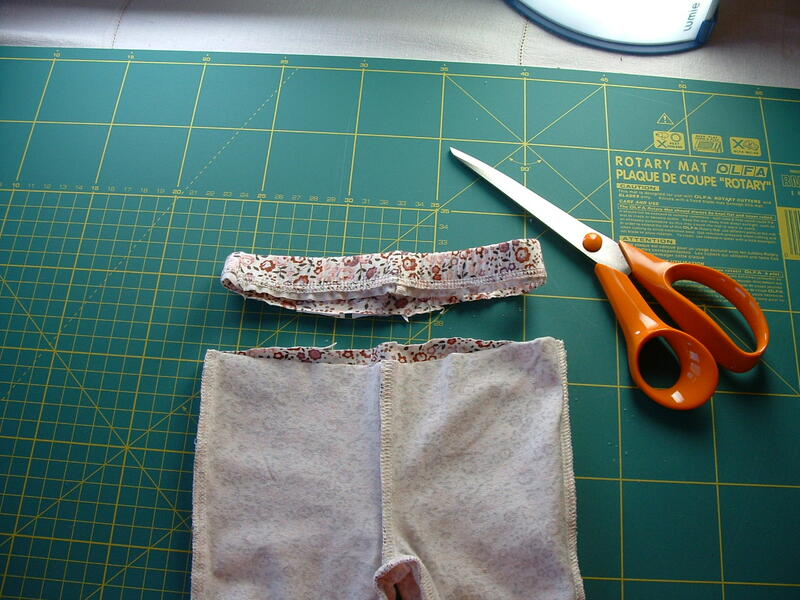 Trim away the excess fabric leaving a seam allowance of a ¼ ” (7 mm), then neaten the edges with a zigzag stitch. I found my new overlocking foot made this really easy. Trim away that excess fabric. 9. Now you can form the casing for the elastic waistband. 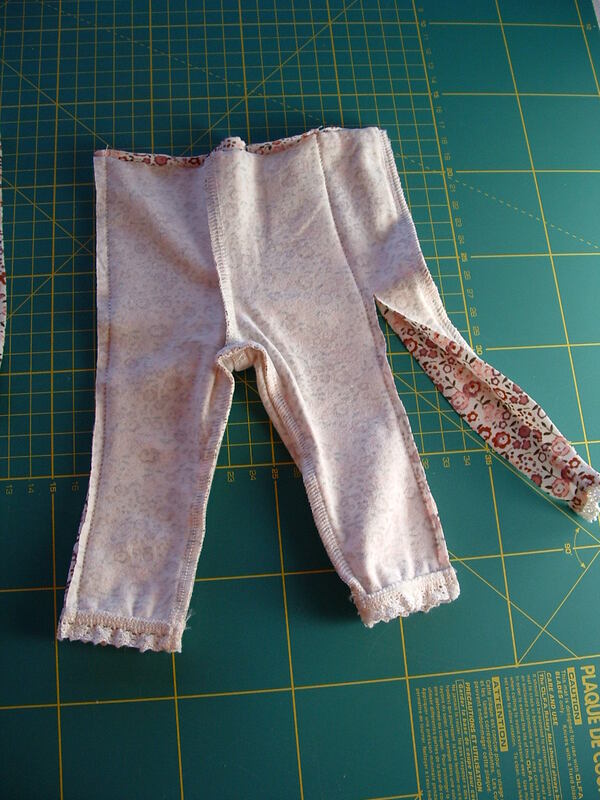 Still keeping the leggings inside out, fold over ¼” (7 mm) and then fold over another ½” (1.5 cm) and pin close to the lower edge. This makes a casing wide enough to slip some ¼” (7 mm) elastic into. 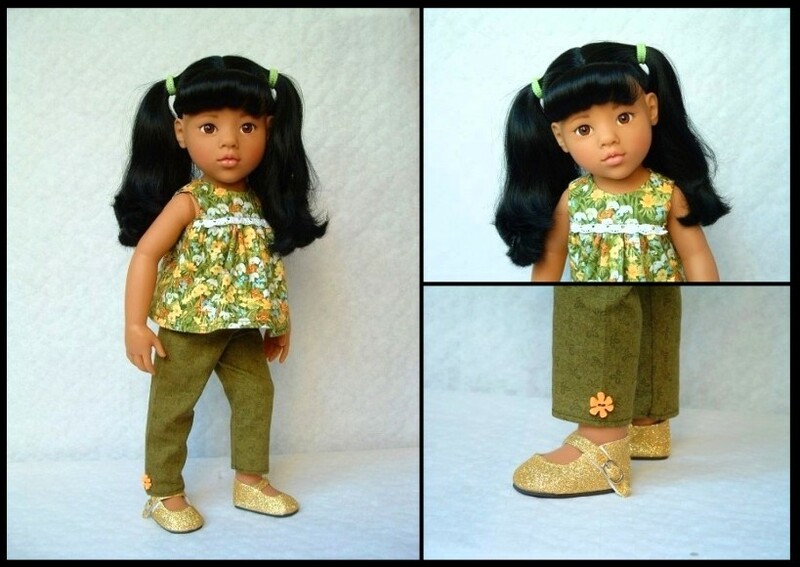 Carefully turn the leggings the right way out and try them on your doll. The points of pins will be inside so mind you don’t scratch her (or yourself). 10. Keeping the leggings right side out, and starting about 1″ (2.5 cm) to the right of the centre back seam, stitch around the waistband close to the lower edge of your new casing, leaving a gap of about 1 – 2″ (5 cm) at the centre back. 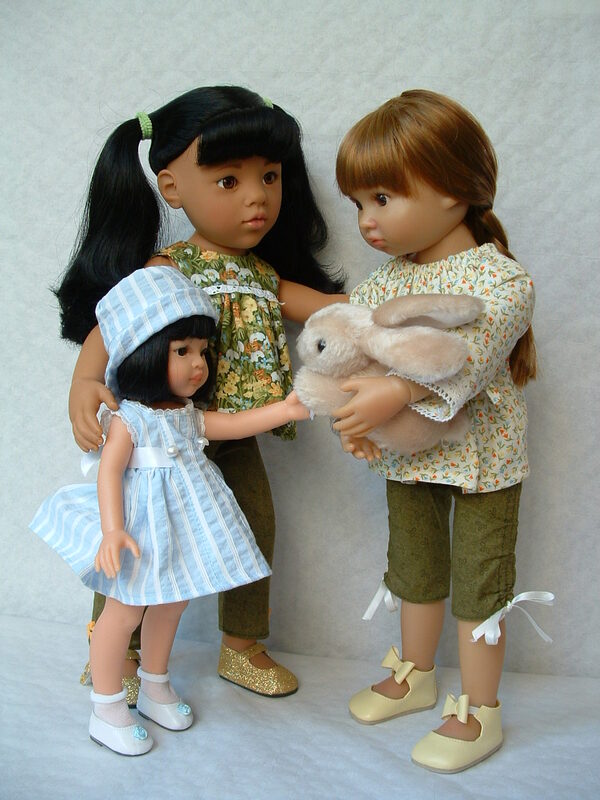 Cut a piece of ¼” (7 mm) elastic equal to the waist measurement of your doll plus 1″ (2.5 cm) extra for overlap. Pin a safety pin through one end of the elastic and use this to thread it through the casing. A pin at the other end will stop it disappearing into the casing. Once threaded through, check the elastic is not twisted in the casing, then overlap the ends by 1″ (1.5 cm) and zigzag stitch them together. Slip them back into the casing and using a stretch stitch, stitch down the last two inches of the casing, taking care not to stitch through the elastic. All done! Time for a pat on the back. 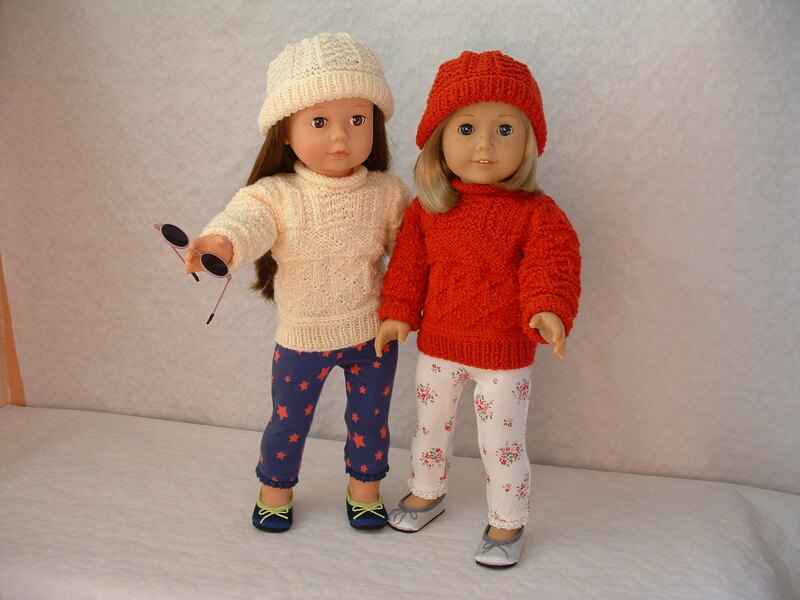 And here’s Elisabeth and Kit showing off the leggings I made for them. I hope this has been helpful. Happy sewing, everyone!